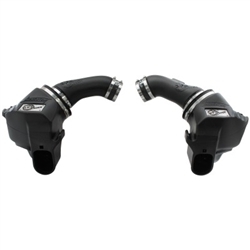 The smooth one-piece high quality sealed dual housings with auxiliary air scoop is used to eliminate the use of multiple-piece housings and ensure the coolest air intake charge available. A large, clear sight window is used for a hassle-free filter inspection and an aggressive style. The Momentum intake is designed around a pre-oiled, large 6-1/2" Tall round inverted top 360 degree radial flow performance air filter with 5-layers of progressive finer mesh cotton media providing maximum airflow and performance. The unique air filter-to-housing interface (patent pending) allows for maximum filter size which increases the available air volume while simplifying the installation process. Premium clamps and reinforced silicone couplings are used for strength and durability while also providing the most secure installation available. Momentum intakes are designed with fewer parts for a quick and simple installation.